Have you ever dreamt of meeting alpacas up close? Perhaps you'd like to hand feed alpacas, or just chill-out with them? Would this type of experience make a unique gift for a loved one on a special occasion? Amazing Alpacas are now pleased to offer private farm visits for individuals, or groups, who wish to experience alpacas first hand. ‘Meet the Herd’. We will introduce you to our herd, talk about their background and explain how we care for them. You'll have a chance to hand feed a few and get to see them up close. ‘Meet an Alpaca’. We will halter an alpaca and give each member of your group the chance to get hands-on with it, have a cwtch (Welsh cuddle) and pose for selfies. For young children we are happy to tandem halter an alpaca to one of our own handlers for safe control. 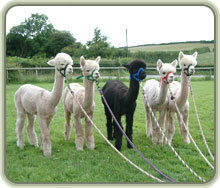 You are welcome to take pictures or videos of your time with our alpacas and our handlers are happy to assist you. Cost - £20 per adult. Young people aged 12 to 16 - £9. Children 11 and under - free whn accompanied by paying adults. ‘Meet the Herd’. We will introduce you to our herd, talk about their background and explain how we care for them. ‘Meet an Alpaca’. We will halter an alpaca for selfies and pictures and give members of your group the chance to see them up close, handle them and maybe give them a few treats. 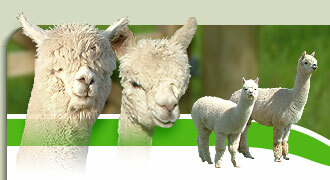 You are welcome to take pictures or videos of your time with our alpacas. Cost - £100 for groups of 6 to 12 people and £150 for groups of 13 to 20 people. Special rates for supervised educational and youth groups. Please contact us for details. We are happy to tailor a package to your individual requirements if you have something particular in mind. Children are welcome on the farm, but they need to be accompanied by responsible adults for their own safety (maximum 3 children per adult please). Dogs are not permitted on the farm, so please leave these at home. Private visits can take place daily throughout the year and in the evenings during summer months. Alpaca Encounters take place outdoors and while our alpacas don’t mind being out in the rain, it’s more comfortable for people in dry weather. If it is raining on the day of your scheduled visit, we’re happy to postpone to a dry day if you prefer! To make a booking or to arrange a tailored package, please contact us. "Just a few lines to thank you both from the three of us, for a lovely Sunday morning with your alpacas. We were so impressed with your knowledge and enthusiasm and have fallen in even more in love with such beautiful animals. This was one of my best birthday presents and I'm very grateful to you for making it so special." Mrs GS, Suffolk. "Very many thanks for a wonderful time on Monday with you and the alpacas. Georgina and Alice thought it was wonderful; they are still talking about feeding and leading the alpacas. Also thank you Peter with your help with the wheelchair." Mrs AT, Ross-on-Wye. 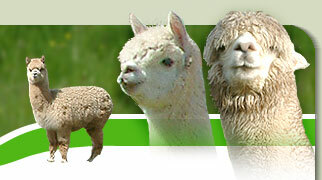 "We just wanted to write to thank you both for a wonderful time with your alpacas and, of course, meeting both of you. Melissa hasn't stopped talking about them and said she would definitely like to return when the young babies arrive. Again thank you for your hospitality. We learnt a lot about alpacas and thoroughly enjoyed ourselves. Mrs JB, Cardiff.